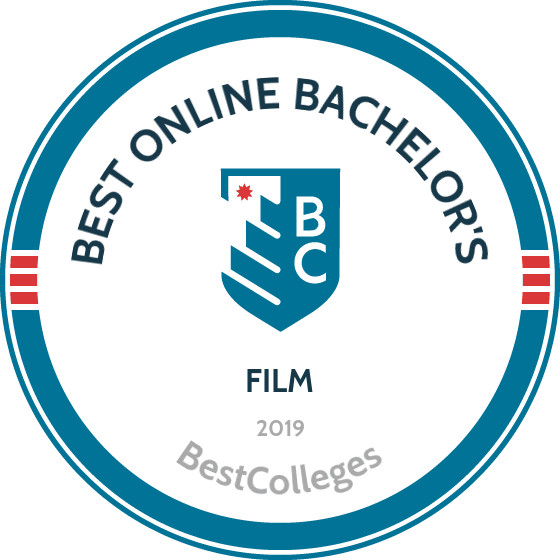 What Are The Best Online Bachelor's in Film Programs? What Else Can I Expect From an Online Bachelor's in Film Program? Earning a degree in film is a great way to kickstart a fun, lucrative career in a fast growing industry. The Bureau of Labor Statistics predicts that, over the next decade, jobs in film and video editing will grow even faster than the national average. Now is a great time to start your bachelor's degree in film. This guide outlines what you can expect while earning your film degree online, and walk you through the important steps to consider before selecting the program that's best for you. ASU offers an online film degree rooted in the latest methods and technologies in film, television, and digital video production. The program covers the practical and artistic aspects of the field and teaches students skills in media arts, production development, storyboarding, distribution, and exhibition. Students can choose from concentrations in media and society, media industries, screenwriting, and styles and genres. The 120-credit BA in film and media studies includes 39 total classes, including 45 upper-division credits on subjects like cultural issues in the media, portrayals of race and gender in film, emerging digital media, screenwriting, and world film. Each online term lasts 7.5 weeks. ASU's distance learners can access digital library resources, career services, online tutoring, technical assistance, and a student success center. Students must maintain a 2.0 major and cumulative GPA to graduate with an online film school degree. To apply as an incoming freshman, a prospective student must demonstrate proficiency in English, math, science, social science, foreign language, and fine arts. Applicants also must achieve an ACT score of at least 22 and maintain a high school GPA of 3.0 or above. Transfer students submit official college transcripts, which must reflect a minimum GPA of 2.0 for residents and 2.5 for nonresidents. Students may transfer up to 64 credits from an accredited institution. Located in Tempe, ASU is accredited by the Higher Learning Commission. Located in Beaumont, Texas, Lamar University offers an online BS in communication with a film studies concentration. The program allows students to work on motion picture film projects throughout all four years of their schooling. Students begin with introductory courses in video production before tackling advanced studies in editing, special effects, cinematography, audio recording, and video production. Major-focused coursework covers TV writing and performing, interviewing, film theory, communication law, intercultural communication, and pop culture theory. Students also take 24 credits of film classes, such as screenwriting, film directing, digital editing, and corporate video production. The school offers online students numerous opportunities to engage with their fellow learners while providing services like tech support and an electronic library. Distance learners at Lamar can choose from five-, eight-, and 15-week classes. The school's online courses feature an asynchronous format, which means distance learners can log on and complete assignments largely on their own schedule. On-campus equipment and tools are available for student projects. Students must achieve a grade of C or better across 120 total credits to graduate with an online film degree. Individuals applying as incoming freshmen must provide their high school transcripts and ACT or SAT scores. Prospective transfer students must submit transcripts from all postsecondary institutions they previously attended. Lamar is accredited by the Southern Association of Colleges and Schools Commission on Colleges. The University of Montana School of Media Arts delivers one of the nation's best online film degrees. Its BA in media arts emphasizes interactive media, emerging digital technologies, gaming, and digital design to prepare students for the evolving media arts professional world. The four-year, 120-credit program includes courses on digital technology, creative coding, sound design, interactive media, web design, and motion design. Distance learners can benefit from the resources available through the university's student success office, including writing and public speaking assistance, tutoring, technology support, academic advising, and career services. Media arts students can also access a digital library, resources for military veterans, and a peer connection network. To apply to the online film degree program as an incoming freshman, a prospective student must provide their official high school transcripts and ACT or SAT scores. Applicants need at least a 22 on the ACT and 1120 combined on the SAT, along with a 2.5 high school GPA. Transfer students may apply if they have achieved at least 12 college-level credits at an accredited postsecondary institution. Finally, the school provides a financial education program focused on budgeting, savings, responsible credit use, and financial aid. Located in Missoula, the University of Montana is accredited by the Northwest Commission on Colleges and Universities. Like any degree program, details will vary from school to school, and program to program. The section below includes sample coursework and degree timelines you may expect from your online bachelor's degree in film. While course offerings and requirements vary by institution, the list below provides a few examples of courses you might encounter in a film degree. Intro to Film: A basic requirement for most film programs, this course explores various cultural and technical aspects of film, including cinematography. Screenwriting: While learning various aspects of film, students also learn how a screenplay is conceived and written. This course studies different screenplays to analyze their elements and style, and lets students experiment in writing their own. New Media and Culture: Typically offered as a seminar-style class covering special topics, which may include the rapidly changing digital world, digital media, or the cultural influences on contemporary film. How Long Does it Take to get an Online Bachelor's in Film? Because each program differs in its requirements, a number of factors influence the length of your degree in film. Generally speaking, bachelor's degrees require around 120 credits to graduate. Depending on whether you enroll part- or full-time, and the formatting of the school's terms, you might take between two and four years to complete your degree. Some schools offer accelerated options that allow you to complete courses in five-to-eight weeks, as opposed to taking a full 15-week semester. Part-time enrollment also affects the duration of your program; full-time students generally earn their degree more quickly. Some programs also offer cohort learning, which means you begin the program with a group of peers, and complete the program alongside them. Other programs may allow for an individualized option that lets you complete coursework at your own pace. Regardless of which program you choose, it's essential that is accredited. Accreditation is the process by which various regional and national accrediting agencies ensure schools and individual programs are meeting certain academic standards. When a school is accredited, it means an accrediting agency has vouched for the validity and quality of that school and its degree programs. Schools can be nationally or regionally accredited, but it is more common to find regionally accredited colleges. While regional accreditation is usually more rigorous and, therefore, more prestigious, it also impacts one's ability to transfer credits. For example, regionally accredited schools may not accept transfer credits from nationally accredited ones. Additionally, some degree programs may also hold major-specific accrediting agencies; film programs are often accredited by the National Association of Schools of Art and Design. There are a number of organizations oversee accrediting bodies. The Department of Education requires all students applying for federal aid to attend accredited schools. Similarly, the Council for Higher Education Accreditation is another resource for finding accredited institutions that meet the standards to receive federal aid. Both the DOE and the CHEA offer searchable databases of accredited schools and programs. Careers in the film industry are growing at impressive rates, making it a perfect time to earn your degree in film. The table below outlines median salaries for five occupations that graduates of these degree programs often pursue. However, keep in mind that salaries can be impacted by professional experience level and the individual workplace. A bachelor's degree in film prepares graduates for a variety of job opportunities upon graduation. While some may work in areas that directly within the film industry, others may find positions in broadcast news, writing and editing, or art direction. People in these areas are often interested in all kinds of art and creative pursuits, and generally desire a career that allows for significant creativity. Editors and camera operators may work in a variety of roles, including television and movie production. They edit raw video footage, -- sometimes under the guidance of a project's director -- to create a final product that entertains or informs viewers. Although common within the film industry, producers and directors also work in live theater, television, and other performing arts. They produce and direct based on a writer's script or screenplay. These professionals often have prior experience in the field before taking on these roles. These technicians set up, operate, and maintain the electrical equipment used to create productions. They may work in radio, television production, movie production, or even as sound engineers for musicians. A degree is helpful for this field, but a special certificate may also add to your qualifications. News reporters work in all kinds of environments, including on-location reporting and in-studio broadcasts, and on national news outlets or local ones. They also work for digital or streaming news outlets, or other online spaces. These directors create a visual style in creative productions, including movies, television shows, magazines, newspapers, and even product packaging. Often, these are self-employed professionals who choose their projects on a contract-basis, providing a lot of professional freedom to pursue projects they're passionate about. Funding your online education can often feel overwhelming. There are many options to choose from, but before making any decisions, you should complete the Free Application For Student Aid (FAFSA). This form determines your eligibility for federal student aid, including scholarships, grants, and student loans. You may also find local opportunities for scholarships, including contests, local businesses, or even your current employer.